There have been many times in my life when I could’ve seriously used some advice on how to be happier. If you’ve read about my teenage struggle with depression and self-injury, my months of being homeless, or my personal struggles right before I met Mary, you know the path to happiness hasn’t always been easy for me. But, around 8 years ago I made a decision that changed my life, and taught me the secrets to happiness I’ll share with you today. It was late 2003. I’d filed for divorce in July after 18 months of marriage counseling, but we were still living in the same house due to financial issues. I was in a long distance relationship with a woman in Toronto, who broke up with me repeatedly out of fear things wouldn’t work out long-term. It was Christmastime, and I was lonely and miserable and unsure how to move on with my life. So I did what any (in)sane person would do: I signed up for an improv comedy class. 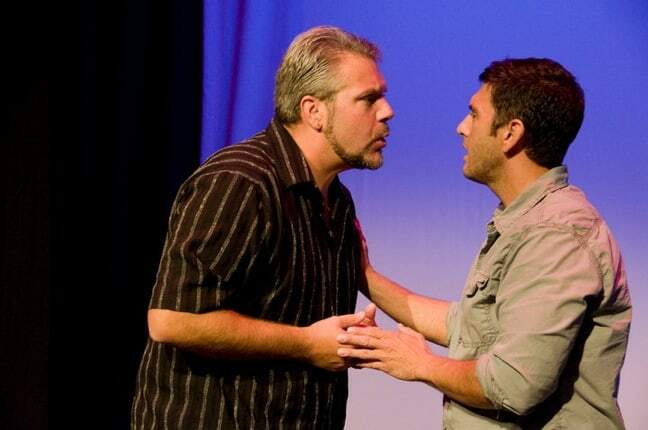 It might sound ridiculous, but in retrospect studying improv proved the perfect thing for me. It got me out of the house and out of my head. It allowed me to socialize with new people and laugh and be ridiculously silly. But, perhaps more importantly, it set me off on an 8-year journey of personal discovery that taught me how to be happier, more positive, more creative, and a better partner when the woman of my dreams eventually came along. The first thing Chris Blair (my first improv instructor at Dad’s Garage Theatre in Atlanta) taught us is that failure is funny, so don’t be afraid to fail. In life, we may not want to think of our failures as amusing, but we should learn to look at our failures as essential growth experiences that make us stronger, smarter, and better able to avoid mistakes in the future. Nobody lives a life completely devoid of failure. It’s what we learn from mistakes, and how we rebound from them, that ultimately define us. One of the biggest mistakes novice improvisers make is to come onstage with a pre-determined idea of how they want a scene to go. Unfortunately, both in improv and in life, while we may be the Captains steering our own ships, we ultimately have little control over the wind in our sails (or the people with whom we interact). There are a zillion different factors that can affect the outcome of any given situation, and I spent a significant portion of my life being driven mad by the fact that the reality of what was didn’t measure up against my expectations of what SHOULD be. You know the old Serenity Prayer about accepting the things you can’t change and having courage to change the things you can? It’s one of the toughest lessons to learn, but improv helped me realize that it was better to have a general destination in mind for where you want your life to go, while at the same time remaining flexible about the path you take in getting there. Improv’s central philosophy is “Yes, and…” The idea is that, no matter what your partner says or does, you accept and build on it, piece by piece, gradually constructing something bigger and better together. “Yes, and…” doesn’t mean you have to agree with everything, but you do have to acknowledge and accept it before adding your 2¢. The power of this approach is absolutely astounding, and its applications in life and business have proven incredibly valuable. When Mary got laid off in 2010 and was considering taking a low-paying job that would allow her to use her skills in assisting entrepreneurs with creative vision, together we brainstormed the idea that became Green Global Travel. She will likely make as much this year from GGT as she would’ve made working under someone else, yet she has more ontrol over her own schedule and financial destiny. Before you say “No, but…” to something and dismiss it completely, take time to absorb it, investigating whether there is some kernel there that could be built and improved upon. Inevitably, this positive exchange of ideas, communication, communal collaboration and progression can help improve any relationship or business strategy. One of my biggest problems as an improviser was that I was a great listener, but all too often I would focus so strongly on my partner that I forgot to take care of my own character’s wants. The “want” is our hopes, our dreams, our primary goals in life that we want to achieve. And, all too often, we allow ourselves to deviate from those wants because of various life circumstances. Improv taught me that you can (and should) acknowledge and be affected by the circumstances that surround you, adjusting to them with malleable fluidity. But, for the most part, you shouldn’t let them deviate you from your ultimate path. As stated above, we don’t want to have a fixed agenda that turns us into super-controlling, type-A jerks. But keeping one eye on your ultimate destination as you navigate the various curveballs life inevitably throws your way allows you to stay focused and driven, adapting to circumstances without losing sight of your goals. Another common mistake among novice improvisers is to sit (or stand) in one place, talking about things but not actually doing anything. In all but the most skilled and clever improvisers’ hands, lethargy= death. The same can be said of life! One of my favorite movie scenes of all time is the opening to Pixar’s UP! For those who haven’t seen the animated classic, the silent scene shows a young couple who yearn to travel to South America, and put their change in a jar to save for their dream vacation. But life gets in the way, situations arise and, eventually, the female half of the now-elderly couple dies, never having realized their biggest want. Tragic, right? There’s a saying in the ‘hood in which I grew up: “Don’t talk about it, BE about it.” I grow impatient when confronted with people who only want to moan and groan about their problems, but never seem to be able to find the cojones to actually DO something about them. In improv, we learn that audiences love to see performers doing things rather than talking about them, and the boldness of taking action almost always leads to more interesting and productive results. Special thanks to Jim Karwisch, John Sexton and the entire cast of Improv Monster, which was easily the most joyous performing experience of my life.